Saturday night, “TxB” opened at Toy Art Gallery. This is a joint show between Bwana Spoons and T9G that marks the launch of their new TxB toys produced by TAG. Carlos and I stopped by the opening, but you can read more about that in my latest Cult Stars column for L.A. Weekly. 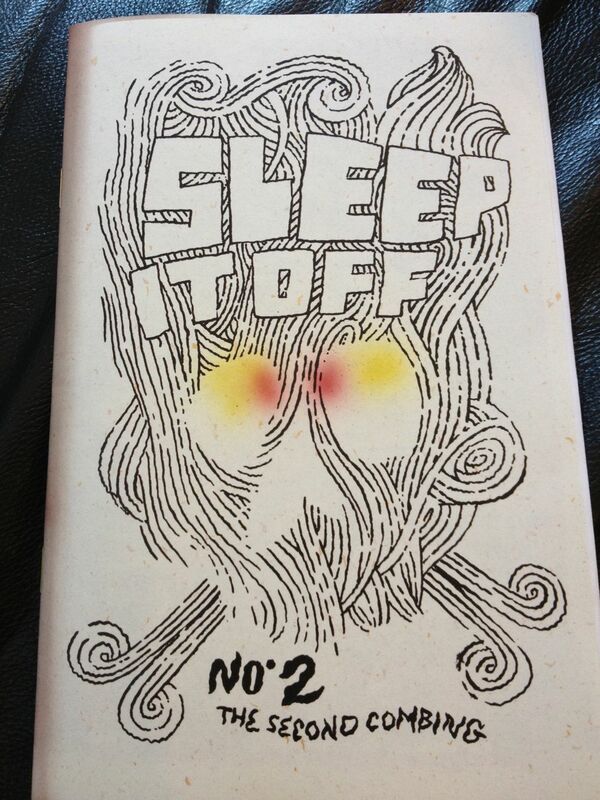 While we were there, I picked up new issue of Bwana Spoons’ zine, Sleep It Off, for the low, low price of $7. I’ve been a zine reader since my stereotypically ’90 teenage years. (This may sound weird, but the late, great Tower Records in Northridge had the best zine section in the whole Valley, it was actually better than a lot of places over the hill.) So, I was extremely excited to pick up one from an artist whose work I think is pretty damn awesome. A lot of my friends are visual artists and they tend to post warm-up sketches and other exercises online. I thought I might as well do the same with my writing. I write a lot, often in flurries, frequently on my iPhone while sitting in a Metro car. Most of what I write never gets published, it’s more for practice than anything else. These are my free writing exercises. They are based on real life, but will eventually make their way into fiction, hopefully where they will rely more on plot and character than rants. Also, since these are free writing pieces, there will likely be grammatical errors and typos. I’m keeping it real. Deal with it. Somewhere in the depths of my long, yet unimpressive resume, there should be an entry that reads Popcorn Empress, United Artists Theaters. Yes, I worked a movie theater concession stand. Job recruiters take note, I’m not only an experienced writer, editor and DJ, I am highly skilled at layering butter throughout the large tub of popcorn I upsold you. I can also scrape popcorn out of dried puddles of regular soda, but you can’t pay me enough to ever do that again. It was sophomore year of college and I couldn’t get hired anywhere on campus after leaving the exciting world of soliciting donations from people who were still paying back student loans. Everyone was on my case about working, so I took the first job that came my way. Going back to my parents’ house every weekend to work at a movie theater couldn’t be that bad, right? At least I would get to see movies for free.